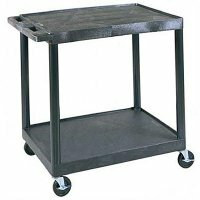 Large capacity two shelf 33" high utility cart with 4" swivel casters, two with locking brakes. Clearance between shelves is 25". Easy assembly with a rubber mallet (included). Heavy duty tool carts and utility carts are made from strong, durable and corrosion-resistant polyethylene plastic which includes a Luxor lifetime guarantee. They will never scratch, rust or even dent, and these utility carts are unaffected by acids and solvents that may already be deteriorating your metal carts.